With Shabbat Zachor approaching, that means that it's soon going to be twenty, yes 20 years since "my terror attack" when I was run over by an Arab terrorist. Today the sidewalk where I had been standing with a few dozen others does not exist. It's the crosswalk over the lightrail tracks. 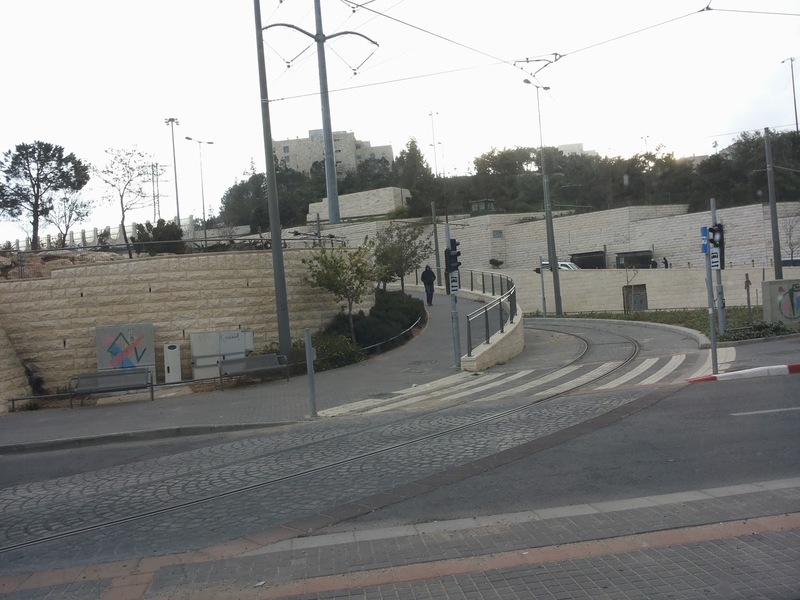 Twenty years ago there was no light rail, and to go to Shiloh, other Mateh Binyamin (County) communities and the Shomron, Samaria, one continued down the road through Ramalla. This was the place with lots of bus stops, besides being a trempiada. At the time, the Arab terror tactic/weapon of choice was explosives to blow up oneself and as many bus passengers as possible. This was the time of Arab suicide bombers, think of the World War Two kamikaze pilots who killed themselves while trying to blow up Ally/American ships. Not just any culture can train/indoctrinate to do such things. I'm pretty sure that there hadn't been any Arab terrorist rammings, like the one I had experienced, before this one. There had been knifings/stabbings, shootings and the suicide bus bombers. And during the few weeks before the attack, there had been lots of suicide attacks. To try to calm down people and since the police/army hadn't been there, they first announced that it had been an accident and began prosecution of the young men who neutralized/executed the terrorist on the spot after he had jumped menacingly out of his car. Considering that the terrorist's car had made a sharp turn over my foot, knocking me down to the ground, I was very lucky that I wasn't seriously injured. Many others were, because he drove into the crowd waiting for buses and rides. A woman was murdered, too, by him. I've blogged a lot about the attack over the years, because it happened, and although today I have recovered physically, one can never wipe out such a thing. And this is the season that the memories get stronger and stronger, especially considering that today's arab terrorists have been utilizing this terror attack method. And no doubt, I'll blog more about it. Remember that Shabbat Zachor, the Shabbat before Purim is when we are commanded by Gd to remember what Amalek had done to us and what the modern Amalek is still doing. It's clear in my mind that the Arab terrorists of today are today's Amalek. Do you have any questions about the attack you'd like answers to?